Apple mentioned last June that it was working on a new Eyes Free mode, explaining that it was working with various car companies to bring Siri voice command to automobiles. And now it seems GM is at the head of the line, as it just announced that it will be featuring the Apple tech next year in the Chevrolet Spark and Sonic. GM is no stranger to mobile tech, as its Cadillac division has integrated a mobile phone–driven infotainment system, the CUE, into its XTS and ATS models. And now it looks like Chevy's getting in on the act with its own solution as well — Apple's Siri is headed for select Spark and Sonic models. The iOS feature will be part of the MyLink system, bringing voice command to the vehicles as soon as early 2013. – Minimize distraction even more by keeping the screen of the iPhone from lighting up, even when Siri answers simple questions such as game scores or the dates of national holidays – While in Eyes Free mode, Siri will not provide answers to complex questions that require displaying a web page. What we don't see on the list is "provide maps/navigation," which would be a curious omission for a car system if it weren't for two things: First, Chevy has its own solution called BringGo, for a "bring your own maps" smartphone-based solution. Second, Apple has been battling its infamous Maps woes since the iPhone 5 debuted. In response to the public outcry over its flawed Maps application, the company axed the manager responsible, Richard Williamson, and is now hitting up TomTom for advice on how to fix Maps. In particular, Apple is addressing complaints about its point-of-interest data, and is asking TomTom for help with landmark info as well as navigation. None of those Maps worries seems to have slowed the iPhone 5, however. Not only is it the top news story on Bing, but in the three months since the current Apple smartphone debuted, its numbers have shot it past Android in the U.S.
Are you interested in voice command in your car? Are you interested even if it doesn't include navigation? (Or is it better not to have Apple Maps directing you?) Weigh in. LOS ANGELES – Early next year, the Chevrolet Spark (1LT, 2LT) and Sonic LTZ and RS will integrate Siri, the intelligent assistant that helps get things done just by asking. Chevrolet made the announcement today at the Los Angeles International Auto Show. Through the cars' standard Chevrolet MyLink infotainment system, customers with a compatible iPhone* running iOS 6 can direct Siri to perform a number of tasks while they safely keep their eyes on the road and their hands on the wheel. To further minimize distraction, Siri takes hands-free functionality even further with an Eyes Free mode that enables users to interact with their iPhone using nothing more than their voice while keeping the device's screen from lighting up. Owners simply connect their iPhone with the MyLink radio via Bluetooth, pair with the system, and use the steering wheel voice activation button to begin and end sessions with Siri in Eyes Free mode. • Minimize distraction even more by keeping the screen of the iPhone from lighting up, even when Siri answers simple questions such as game scores or the dates of national holidays • While in Eyes Free mode, Siri will not provide answers to complex questions that require displaying a web page. "It says a lot about our commitment to small-car customers that Chevrolet has announced that Siri Eyes Free capability will be available in the Spark and Sonic well before the luxury brands," said Cristi Landy, Chevrolet marketing director for small cars. "Safe, easy, reliable and portable connectivity is a top priority for our customers, and Siri complements MyLink's existing capabilities to help deliver an incredible driving experience." Both the Spark and the Sonic also come with six months of OnStar's premium Directions and Connections service. 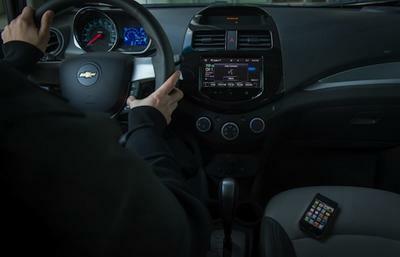 OnStar brings added safety, security and connectivity to these vehicles, including services such as Automatic Crash Response, Stolen Vehicle Assistance, Vehicle Diagnostics and Roadside Assistance. Most smartphone owners can also download the RemoteLink Mobile App, which allows OnStar subscribers to control and manage certain vehicle functions from their phone. For more information on OnStar's services, visit onstar.com. Founded in 1911 in Detroit, Chevrolet is now one of the world's largest car brands, doing business in more than 140 countries and selling more than 4 million cars and trucks a year. Chevrolet provides customers with fuel-efficient vehicles that feature spirited performance, expressive design and high quality. More information on Chevrolet models can be found at www.chevrolet.com.